I used these as a project for my stamp clubs this week and am making a few to sell at the Holiday Bazaar on the 20th at Discovery Elementary School. 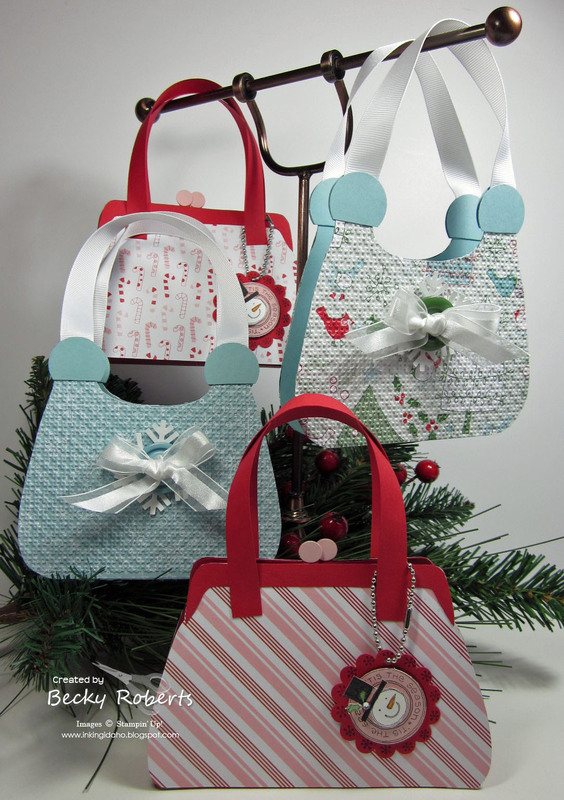 They are from the Tres Chic Handbags tutorial available HERE if you want to make some too. Yesterday I posted this photo and had questions about how to make it. 1. The Baja Breeze cardstock is 8-1/2" x 3-5/8". Fold in half for the present/card bottom. Seal the two long edges with Sticky Strip leaving the top opening to insert the card. DSP for the present is 3-3/8" x 4". Punch half a circle in the center of the top, then add a strip of ribbon. 2. Present top piece is 4-1/4" x 3" Score at 1-1/2" and fold in half. 3. Inside piece is: Real Red 4-1/4" x 2-7/8" & Whisper White is 4" x 2-5/8"
4. 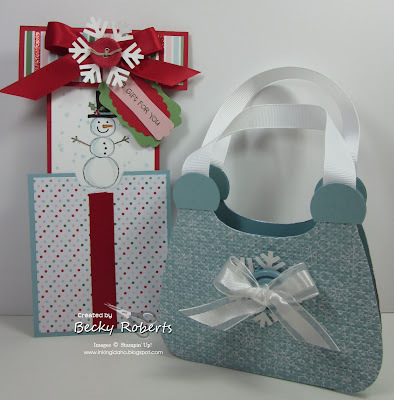 Add Stampin' Dimensionals near the top on either side of the snowman piece. Lay the stamped image on the Dimensionals. Add two more Dimensionals on top of the snowman piece and close the lid. Now it stays open slightly so it slides down over the present realy easy. 5. Embellish the lid as desired. Can you believe it?...starting Monday, November 15th you can join the Stampin' Up! family and my team for only $87.50. That is half price folks!!!! What do you call it when you get over $310 in Stampin' Up! 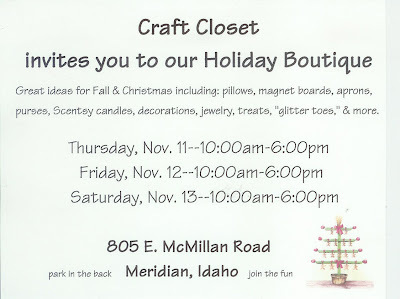 crafting & business supplies for only $87.50? You call it SIMPLY AMAZING!! From November 15-30, you can purchase either the Standard or Digital + Starter Kit at 50 % off the regular price..... plus free shipping! 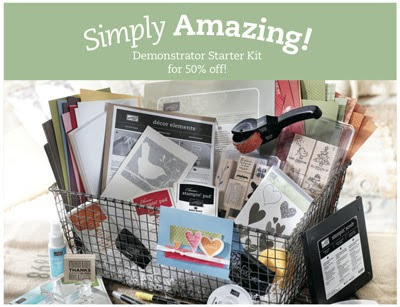 If you'd like to become a Stampin' Up! Demonstrator for the awesome price of $87.50 contact me today at yasou@cableone.net or on Monday, just go to my Demonstrator Website HERE and sign up! The password is yousignupnow. Check out this show if you are in the area.